A serious head-on collision that sparked an explosion near N.C. Highway 751 and O'Kelly Chapel Road in Chatham County has gone viral. 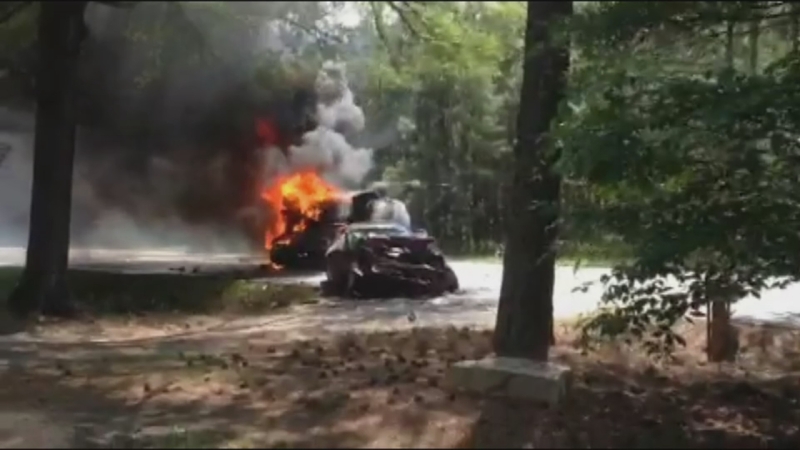 CHATHAM COUNTY, N.C. (WTVD) -- A serious head-on collision that sparked an explosion near N.C. Highway 751 and O'Kelly Chapel Road in Chatham County has gone viral. An eyewitness captured cellphone video of the Good Samaritans who risked their own lives trying to rescue three crash victims. The dramatic images of the roadside heroes have garnered national attention. "This is something we do that's our job," explained Chatham County Deputy David Green. "This is what we have chosen to do." Green was less than a mile away from the crash scene when he got the call for help. Video shows him walking toward a burning vehicle after an explosion. Read More: Watch Army captain drag victims to safety as car goes up in flames. "All I could think about was that we couldn't leave these people be alone. We had to get them out of the vehicle," recalled Green. "By any means necessary, we had to get them out of the vehicle." The State Highway Patrol says 59-year-old Mark Ricketts, of Cary, was trapped inside his burning car. Investigators say he collided with a vehicle driven by 67-year-old William Thompson, also of Cary. His wife, 63-year-old Kathleen Thompson, was also seriously injured. The couple was less than five miles away from their home. Eyewitness video also captured passersby like Fort Bragg Army Capt. Steve Voglezon who was off-duty and headed to a nearby mall. "I was just at the right place at the right time," said Voglezon. "If I hadn't been a soldier, I wouldn't know what to do. The Army has helped a lot." Voglezon was wearing a red Captain America t-shirt as he pulled Ricketts from his flaming car. He went back into the raging inferno for the Thompsons. Click here for more video from the scene. Emergency crews responded to a fiery collision Sunday afternoon near the intersection of N.C. Highway 751 and O'Kelly Chapel Road. His heroic deed has earned him a Soldier's Medal nomination. Firefighters, Deputy Green, and nearby residents armed with fire extinguishers fought off the blaze and then used the devices to shatter car windows. Green says it was unique team that came together for the sake of strangers in need of help. "The heat from the fire, the smoke it makes you start thinking that this might not end well," Green admitted. "I thought we had a good chance of getting them out." All three crash victims were taken to UNC Hospitals. A hospital spokesperson said Tuesday they are no longer releasing updates on their conditions. The shocking crash has heightened the anxiety of those who live along O'Kelly Chapel Road. John Spruell, an eyewitness who shot video of the aftermath, also lives near the crash site. He said recent growth has increased traffic and the number of speeders. "Very little enforcement is being done on O'Kelly Chapel Road. It's not fair," said Spruell, adding that he'll no longer allow his children to drive on the road. Whether speed played a role in this fiery head-on collision is unclear. The Highway Patrol is relying on eyewitness accounts while the people involved recover in the hospital. Troopers said Ricketts was cited for going left of center. There were weather-related wrecks along O'Kelly Road during the winter, according to the Highway Patrol. According to the NC Department of Transportation, there was a request to lower the speed limit below 55 mph in 2007. A DOT study determined the speed limit was appropriate. However, public input in 2010 convinced DOT to conduct another study. Consequently, the speed limit was lowered to 50 mph. In 2012, additional public input prompted a study to drop the speed from 50 mph to 45 mph. After another study, DOT determined a speed limit change would not significantly change driver behavior. NCDOT recently studied the Tobacco Trail Crossing along O'Kelly Road and found that most motorists are slowing down to 45 mph because of pedestrians in the area. "NCDOT will go out and collect more data and use information from the accident report to look into the area," said Ginny Tyson Inman with the NCDOT in an email response. "However our traffic engineers do not anticipate changing the speed limit of the road and do not feel that lowering the speed limit will change drivers' behaviors."